The Rockport Film Review: THIS IS SPARTA! THIS IS SPARTA! cries, Leonidas. He and the 300 Spartan soldiers battle the invading Persian armies in a fight for the ages. A year after graphic novel legend Frank Miller's "Sin City" was marvelously adapted into a stylishly sophisticated film by Robert Rodriguez, Zack Snyder does the same with "300". "300" is a feast for the eyes with its grainy hyper-real look and poetic slow-motion action. 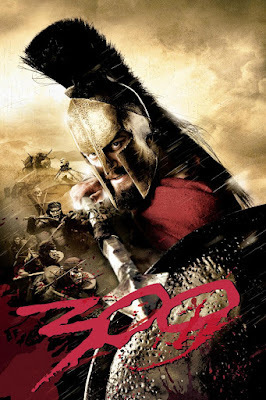 The true story of the 300 Spartan soldiers is stylized and romanticized within an inch of its life but makes it quite entertaining and fun to watch. It's true that this film has been mocked and parodied quite a bit but it still doesn't change that fact that this is just a fun movie to geek out with. As the Persian armies led by the God King Xerxes look to conquer the world, Leonidas who is played by Gerard Butler, hatch a plan to even up the numbers an at least give them a fighting chance. They are victorious in a few battles and get Xerxes attention, he offers them a deal but the Spartans will fight to the death. Respect and Honor is their motto. However, there is a treacherous hunchback who cannot resist the appeal of Xerxes and betrays Leonidas and all of Sparta. I could probably talk more about the story but its pretty much all about the visuals. The rugged 6 pack abs of the Spartans, the slow-motion CGI blood sprays. All of the raw violence and sexuality is where this movie makes it money and everybody knows it, but this is not a bad thing. This is a bloody fairy tale of good versus evil with evil prevailing? The strength and courage of those 300 Spartans fighting impossible odds speak to a wider truth, never give up and never surrender. Seven years later we are given a sequel in the form of 2014's "300: Rise of an Empire" a serviceable sequel but pretty unnecessary. Although major props to Eva Green who really went all out and gave everybody what they really wanted to see. The original is the standard all will be judged by. The 2011 film "The Immortals" tried to use the same formula but came off as a cheap imitation and nowhere near the same experience. It pays to be first I guess. 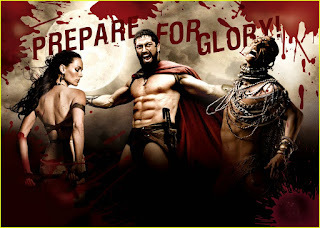 The original "300" is widely available and fun to revisit if it has been awhile.